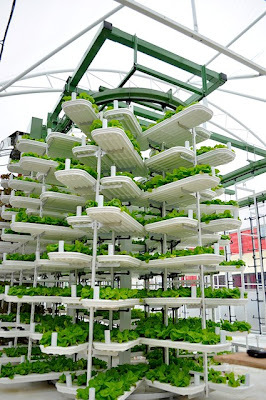 The "verticrop" - a vertical farm created by Valcent. photo courtesy of Valcent Products. Vertical Farming. The name conjures images of giant walls of vegetables with people swinging in harnesses harvesting the ripened produce. This isn't exactly correct, but it does capture the essence of what vertical farming is all about - growing up. Figuratively and literally, growing up is exactly what we as humans need to be doing. With a projected 80% of the world's population living in urban settings by mid-century, the problem of feeding those urban masses is going to become very real, very quick. Vertical farming may offer a part of the solution. In practice, vertical farming is not quite as simple as growing food on walls. The concept is wrapped up in architecture and biology. As detailed by microbiologist, ecologist and Professor of Public Health in Environmental Health Sciences at Columbia University, Dickson Despommier, vertical farming utilizes urban spaces to create completely integrated agricultural systems into dedicated buildings. Vertical farming is conceptualized as a closed system, from seed to product, and one that reuses and recycles it byproducts. 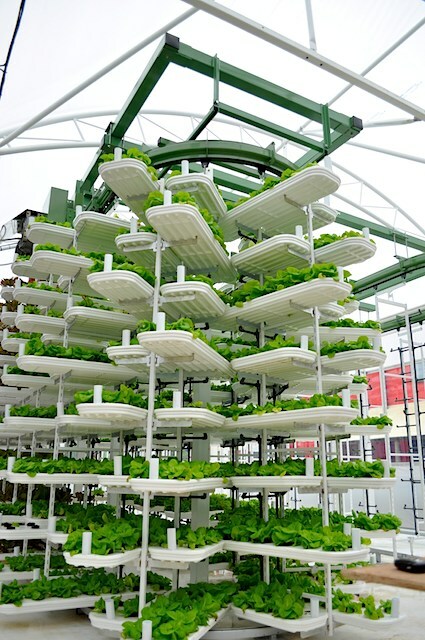 Once in operation, a vertical farm would theoretically need little to no input besides the labor needed to plant, tend, and harvest the products of the farm. This can all be done in a 5-10 story building on a city block. We've included two short videos below that will give readers a better idea of what vertical farming may look like, the concepts behind it, and how it would work. It doesn't appear that any vertical farms are in operation at this point, but this is an idea worth keeping tabs on. Farming in urban settings would be a great benefit to parts of the world where arable lands are short, such as the Middle East and southwest United States. Additionally, producing food where the people are would dramatically reduce the economic and environmental costs of traditional agriculture. Finally, here at Recycled Minds, we've written a good deal about Monsanto and the problematic ways in which they go about their business in the world of agriculture. I've realized recently that we often critique what Monsanto and other companies like them do without offering many positive alternatives or options. It strikes me that vertical farms would be an ideal place to produce Monsanto-derived products. A closed system would allow for long term testing of seeds, and once in production, the closed system would prevent GMO seeds from haphazardly crossing into the (more) natural world. Just a thought! impressive idea actually, and for the gmo seeds, would be a good approach if people considered. Thanks zönkiye - i think this idea has promise too. there appear to be high costs up front though, which may prohibit the idea from really taking off. and yeah, if you keep saying it, does it become so?